Figure 1. Rhizotron root analysis with root growth is traced in infected (green) and non-infected (red) roots. Dieback of infected roots is clearly visible in the photo on the right. Citrus root systems are confronted with many challenges that limit resource availability needed for tree productivity. Challenges are compounded by huanglongbing (HLB), which now affects nearly all citrus trees throughout Florida’s production areas. Contrary to the above-ground portion of the tree, study of the below-ground portion is considerably more difficult. This article provides a brief overview about root function and methodologies to study root growth and development. A healthy root system provides the anchor and support needed to secure a tree in place. More importantly, roots are the lifeline of a plant, taking up water and nutrients from the soil and moving them up into the leaves, where they can interact with sunlight to produce sugars and energy for tree growth and fruit production. Nutrient uptake is mainly conducted by the fine roots (fibrous roots smaller than 1 millimeter in diameter). In addition to taking up nutrients, roots also secrete ions and various organic acids that increase solubility and therefore availability of otherwise non-available nutrients that are essential for plant growth. HLB causes severe nutritional imbalances in affected citrus trees. This is partially due to the damage HLB imposes on the fibrous roots. It is now recognized that improved nutrient management, particularly higher applications of specific micronutrients, is of great importance to maintain or improve health and productivity of HLB-affected trees. As a result, many growers in Florida are now implementing a constant and balanced supply of nutrients to their trees, while planting HLB-tolerant varieties and rootstocks. Understanding the dynamics of how HLB affects the root system may lead to development of new and improved management strategies. Fertilization guidelines in the pre-HLB era are based on content of nitrogen, phosphorus, potassium, calcium, magnesium and micronutrients in leaves of healthy trees. These guidelines are currently being revisited given the prevalence of HLB-affected trees throughout the state, many in early or pre-symptomatic stages of the disease. New guidelines can focus on optimal nutrient concentrations to maintain healthy roots, but gaps exist in our understanding of how HLB progression is affected by different nutrient management strategies. An ongoing project funded by the Citrus Research and Development Foundation is testing different nutrient management strategies and aims to rehabilitate declining trees while restoring root health. Several field trials have recently been established using variable rate soil management techniques for oranges and grapefruit in different Florida production regions. The results will determine the optimal fertilizer dose and irrigation techniques and will relate these to indicators of root health, growth and yield performance. Through this approach, optimal nutrient and irrigation management techniques will be identified and quantified. One aspect of roots that is receiving greater attention is root system architecture. The root system architecture is defined by its shape and its structure. The root shape is the three-dimensional arrangement of the roots in its environment. It can be described by the number of roots, root depth and root length throughout the soil. The root structure describes the different components of the root system and their characteristics and relationships. This includes root age, root diameter, root color and branching pattern, which are directly associated with root physiological properties. The citrus root system architecture can vary greatly among rootstock varieties and is also influenced by nutrient and water availability and diseases, particularly phytophthora and HLB. HLB causes substantial root loss, between 30 and 50 percent in the early stage of infection before visual symptoms are present and during early symptom development (see http://citrusindustry.net/2017/06/02/hlb-and-root-longevity/). Root loss increases to 70 to 80 percent during the later stages of infection. Identifying and developing new varieties with more efficient roots that can better tolerate the HLB-induced damage is critical. Research is underway to decipher differences in root system architecture among rootstock varieties and to determine the adaptive value of specific root traits, their genetic control and their agro-ecological impacts. Results will lay the foundations for a better understanding of the dynamics of nutrient uptake and movement in HLB-affected citrus trees and their effects on root health and rhizosphere ecology. Historically, studies on root traits have been limited due to the challenges of excavating root systems for phenotyping (i.e., assessing the physical characteristics of the roots). However, deciphering root system architecture including branching, number of roots, root diameter and root angle in various root classes is of great importance as it will affect plant growth and health. Figure 2. 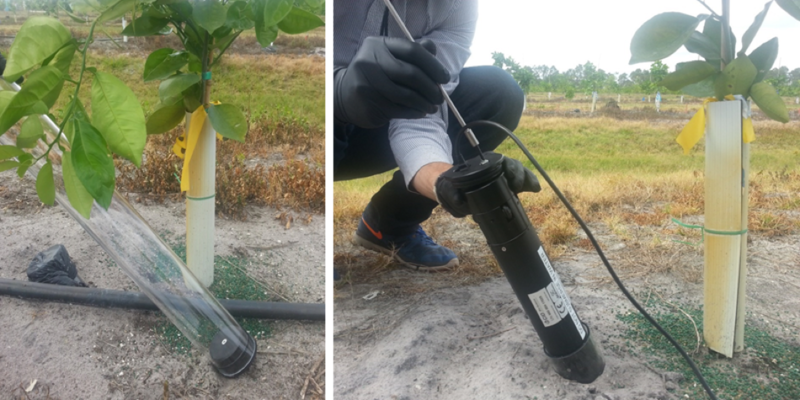 Minirhizotrons (left) and a camera system (right) are used for in-field imaging of young citrus tree roots. Modern technologies now permit the observation of root systems on location without the need for tree excavation and destruction. These technologies include rhizotrons (Figure 1), minirhizotrons (Figure 2) and 2-D root reconstructions (Figure 3), in combination with sophisticated camera systems and computer analysis software. In close collaboration with horticulturists, plant physiologists, molecular biologists and plant breeders, this work will aid in the identification and generation of new and superior citrus rootstocks that substantially improve productivity under HLB-endemic conditions. The study of the belowground dynamics and the understanding of the interaction between HLB-affected citrus roots, cultural practices and tree productivity is imperative to develop irrigation and nutrient management recommendations in the HLB-era. To develop effective root health management strategies, it is important to understand how root loss occurs and what physiological changes HLB is causing in the roots. Lorenzo Rossi is an assistant professor at the University of Florida Institute of Food and Agricultural Sciences (UF/IFAS) Indian River Research and Education Center in Fort Pierce. Ute Albrecht is an assistant professor at the UF/IFAS Southwest Florida Research and Education Center in Immokalee. Evan Johnson is a research assistant scientist at the UF/IFAS Citrus Research and Education Center in Lake Alfred.